2017 is here and with the turn of the calendar comes a sneak peek of Volume's newest line, rolling out to stores in March. 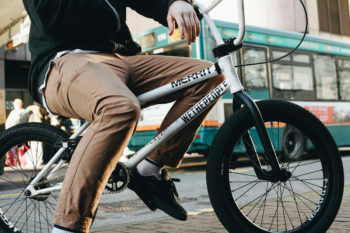 From the subway inspired Billy Perry signature Transit to a metal influenced Hessian cruiser each of the five new bikes have a distinct style and personality that sets them apart from plenty of other bikes on the block. Get a pre-order in now at Volume and you could be enjoying a fresh ride in just a few short weeks. Volume’s top of the line BMX complete, Broc Raiford’s 2017 model, painted with a striking splatter colorway and Broc’s signature Volume/Odyssey goodies. It’s hard to imagine that people aren’t going to eat up that black and blue. No promises you too will be able to bunny hop over the moon though. Volume's entry level District features the most important quality a bike can possess; proper geometry. The District is in line with the modern standards for top tube and chain stay length, along with headtube steepness, which is going to allow you an affordable option to ride like a Pro. Billy Perry has made quite a name for himself recently, with his POV videos filmed in the bustling streets of NYC and beyondhelping to explode his popularity. Volume decided to draw some inspiration from Billy's exploits in the Big Apple and it's subway system for their Transit complete. The subtle galactic splatter paired with white and gray accents make for a bold looking ride. Chrome! Chrome! Chrome! The Hessian is built for speed and ready to rip at the local track or off to an Iron Maiden concert. Well this one just hits you over the head now doesn't it? Here we have a Volume with 10 speeds, full chromoly tubing, and a sweet colorway we carried over from Demarcus Paul's War Horse line. Get ready to smash into spring. Volume Bikes are Official DIG Partners.